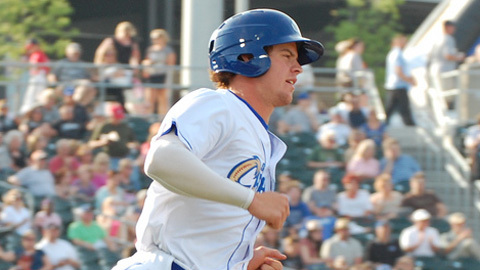 Wil Myers was one of the hottest hitters in the Texas League before his promotion. So far, nobody in the Pacific Coast League has been able to cool him down. The Royals' No. 2 prospect collected three hits, including his first Triple-A home run, on Tuesday, but the Omaha Storm Chasers fell to the Salt Lake Bees, 6-3. Myers went deep in his first at-bat, sending an 0-1 pitch from Major League veteran Juan Rincon over the left-field wall for a two-run homer. He last left the park on May 14, when he smacked two longballs for Double-A Northwest Arkansas. "He threw a fastball up for ball one, then hung a curveball in the middle of the plate and I was able to turn on it," Myers said. The 21-year-old singled up the middle in the seventh for his third multi-hit effort in seven games with Omaha. He capped his night by sending a ground ball through the left side for another single in the ninth. Myers started his second straight season in the Double-A Texas League and batted .343 with 25 extra-base hits in 35 games. He's had little trouble adjusting to life at the Minor Leagues' highest level, hitting .348 with four RBIs and three runs scored. "I'm just staying through the middle of the field," Myers said. "I'm trying to stay the same way I was in Double-A, not try to get too anxious or pull off any balls, not try to get too big, just stay with it." Although Myers has played just one defensive position -- center field -- for the Storm Chasers, that likely will change soon. The plan is for him to get some reps toward the end of the month at third base, the position he played for the first time in his pro career on May 13 with the Naturals. "I've still been taking ground balls there," said Myers, who played third in high school. "I'm still working on everything, playing there and center field. The plan is to get me at third base when we come home from New Orleans [on May 29]." Selected in the third round of the 2009 Draft, Myers is on the cusp of the Majors. But he's not too caught up in when he might be making his big league debut. "It's definitely cool being in Triple-A. Obviously, it's one step away, but I don't really think about that too much," he said. "I just want to go out there and have good at-bats, good games and get better every day."